Both of these options are, again as always, available for Windows, Mac OSX and Linux. As well as Animesh support, the update includes a series of third-party updates and additional bug fixes. As per my release overview, Animesh has been in development for about a year, and like Bento, has been a collaborative effort between Linden Lab and Second Life content creators. Essentially, it allows the avatar skeleton to be applied to any suitable rigged mesh object, and then used to animate the object, much as we see today with mesh avatars. This opens up a whole range of opportunities for content creators and animators to provide things like independently moveable pets / creatures, and animated scenery features. In particular, the user guide and test content offer the best way of getting started with Animesh for those who haven’t tried it thus far. 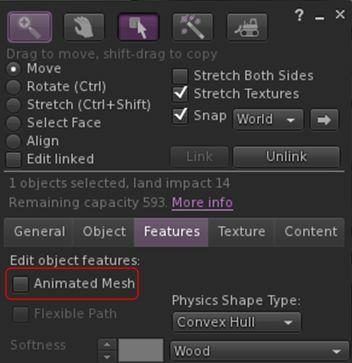 And, Animesh isn’t just for content creators: it has been designed such that just about any rigged mesh can be converted to Animesh directly from the Build / Edit floater. Do be aware, however that simply converting an object will not cause it to start animating – you’ll obviously need suitable animations and a script to run them. Like any other object utilising animation, this is done by adding the animations and scripts via the Edit > Contents tab for your converted object. If you’re not a scripter / animator, you can still use the Animesh test content and have a play around with things. The animation explorer (under World > Animation Explorer). The Money Tracker/Tip Tracker (View > Money Tracker). Phoenix-style extended hovertips (View > Highlighting & Visibility > Hover Tips > Show More Information). 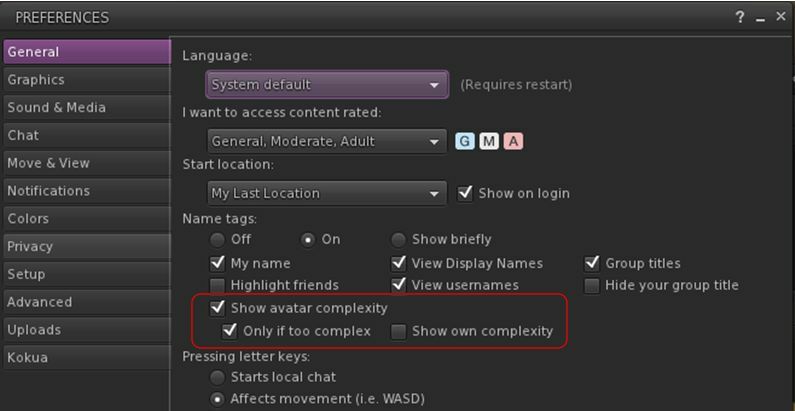 Avatar Complexity score in name tags (Edit > Preferences > General) along with the Only If Too Complex and Show Own Complexity options. A bug fix so that Turning on Full Res Textures works. If RLV is active, the Message Of The Day will appear in chat at login as a substitute to it being suppressed on the login progress screen. Reporting the latest grid status bulletin in chat at login (Edit > Preferences > Notifications). The ‘do not hide worldmap after teleport’ option ( Edit > Preferences > Kokua > General). I’ve not had time to take the viewer for a thorough test of the viewer, and the Kokua team note they’ve not had the opportunity to test Animesh. Therefore, If you see any strange behaviour please check it against the LL viewer and then either raise a Jira ticket on the LL viewer or against Kokua at: https://sourceforge.net/p/team-purple/kokua/tickets/.